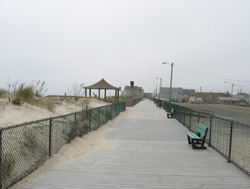 The boardwalk that fronts much of the Dover County managed beach in Ortley Beach is split into two parts. Between the boardwalks is the Surf Club, which also has its own pay-to-play beach. Both of these beaches have lifeguards during the summer. You do need to have a beach badges to be on either of these beaches when the lifeguards are on duty. You can park for free on the street, along the back edge of the boardwalk, and in a public parking lot at the end of 3rd avenue. There is also a parking lot between 6th and 7th avenue, just in front of the Surf Club, where you can pay to park. 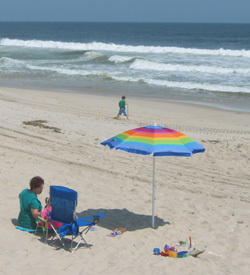 During the weekends and on holidays it can be difficult to find a parking place close to the beach. Unless you arrive early in the morning, you may have to a few blocks west of the beach. The lifeguards begin their season Memorial Day weekend. They are on duty only on the weekends for the first few weeks of the season, then operate daily from June 16th through Labor Day. The lifeguards are stationed on the beach from 9 A.M. until 5 P.M.
You should pay attention to any warnings or directions the lifeguards provide. If you go swimming when the lifeguards are not on the beach - off season or during off hours in the summer - you need to be careful. You should know about riptides and what to do if you find yourself caught in one. Who needs a Beach Badge? When do you need a badge? 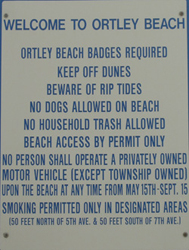 Badges are required from June 16th until Labor day during the time the lifeguards are on duty (9 A.M. until 5 P.M.). The beach is open access at any other time. How much do beach badges cost? These fees are for the 2008 summer season. Where can I buy a Beach Badge? You can buy a daily badge from the badge checkers that are stationed on the boardwalk at each of the the beach access points. The Toms River Recreation Administration Building (1810 Warren Point Rd.). It is open from Mon – Fri, 9:00a.m. to 4:00 p.m. You can also call them at (732) 341-1000 Ext. 8410 with any questions about badges. The Toms River Senior Center (652 Garfield Ave). 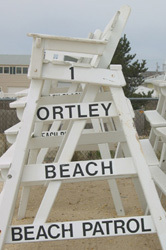 The Ortley Beach Lifeguard Headquarters (on the boardwalk at 4th Ave.). Their hours are Monday through Sunday, from 10 A.M. to 2 P.M. on the days lifeguards are on duty, weather permitting. 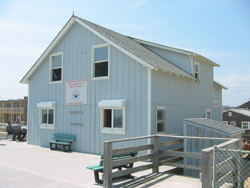 You may also find the lifeguard headquarters open earlier in the season on some days. 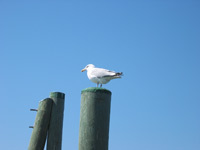 There are bathrooms on the boardwalk at the end of Fielder Ave and at the Lifeguard Station at 4th and Ocean Ave. There are outdoor showers at these locations but there are no changing stations. Beach badges are $7 for the day and $75 for the season. Children under 5 are free. The Surf Club offers outdoor showers, restrooms, a food court, bar, and on-the-beach waitress service. Lifeguards are on duty from 9 AM to 5 PM, daily, from Memorial Day weekend until mid-September. 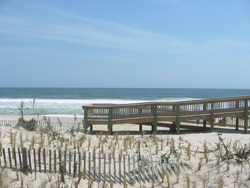 The entry way for the Surf Club beach is just south of where 6th Ave ends at Ocean Ave.